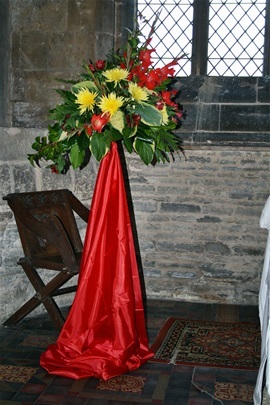 There was an excellent turnout for a demonstration of flower arranging at Hawton Church on Wednesday 3rd April, where a magnificent total of £750 was collected for the Fabric Fund of the church. Well done to all concerned. King John did not pass through Hawton on his last journey to Newark in 1216 but he was close by on the road from Sleaford. His last days were awful ones but he had time to reflect on the errors of his reign on this last journey, and these were rekindled at Hawton Church on 21st October when 'The Death of King John' was performed with a cast of 30 children and adults together with musical accompaniment. The key parts were played by David Purveur as King John, Fiona Hubery as his wife, Daniel Hubery as the doctor who treated him in Newark Castle, Steve Watson as the court cobbler, Steve Cawte as Bandolf, the King's personal aide-de-camps, Peter Tyrer as the Bishop of Lincoln, Mike Phelan as the Deacon of Newark, Baroness Sheila Hollins as Lady Faulconbridge, Jo Ward as Lady Beaufort, Carolyn Pinder as the Cook of Newark Castle, Graham Hodgett, Jonathan Waite, Peter Sargeant, Peter Anthony, Jo Davidson, Nita Pearce as the devout monks and nuns of Swineshead Abbey, and the Reverend David Milner as the magnificent General William Marshal (the model for Sir Lancelot in 'The Tales of King Arthur'), the with the help of a voice-over from Stephen Fry. Bill Mitchell and Roy Parsons were very forceful Newark burghers and Evie Francis, Hetty Leach and Georgina Webb and Aidan O'Donoghue were the young stars who played the royal children and their friends delightfully. The setting of Hawton Church was very different from the Palace Theatre in Newark, where the play had been performed two days earlier, and the architecture of the church set off the play to perfection. The play and music are published under the title the Death of King John from Blue Frog Publications (and Amazon) with the second edition published in 2017, together with the original cast. Norwegian colleagues are currently having difficulty translating some of the new words in the play, 'unfold', 'ogrous' and 'nonnying nincompopple' but they are sufficiently close in origin to translate easily. The play was also performed at Leighton House in London in April, 2017. MARCH - SING A HYMN FOR MUM - 6.30pm on Saturday 25th March, come along and sing some favourite hymns chosen with Mums past and present in mind. £5.00 ea (children free) includes a light supper and refreshments afterwards. There will be a prayer tree for Mums and you may light a candle for mothers and grandmothers departed. All are welcome. APRIL 2017 - OPEN Saturdays start on 8th April, then every 2nd and 4th Saturday of the month from 10am to 12 noon until end October. Free entry, refreshments served, guided tour of our historic church and it's famous Easter Sepulchre. MAY 2017 - Saturday, May 20th - Open Gardens in Valley Prospect area. Starts at 1.30 pm and will cost £5.00 per ticket with map to several gardens all within walking distance of each other. Afternoon Tea options served at each garden. MAY 2017 - Thursday May 25th (Ascension Day) - A pilgrimage walk from Cotham Church to Hawton Church over the fields will be held for the benefit of Newark Patriotic Fund to help wounded service personnel. Get a sponsor or donate yourself. Refreshments will be served at Hawton Church on completion of walk and lifts available back to Cotham church car park. Starts at 1.30pm at Cotham Church. Be at Cotham latest 1pm to register and assemble. JULY - SAT 8TH/SUNDAY 9TH - Nottingham and Southwell Diocese - OPEN CHURCHES weekend. Hawton church will be open both Saturday and Sunday with refreshments, tours, etc planned. A SUMMER FAIR will be held in the church on Saturday from 10am to 4pm. Sunday 9th - Communion service at 0930. Church open for visitors from 12 noon. SATURDAY OCTOBER 28th - Beetle Drive. 6pm The Poplars, Cotham Lane. 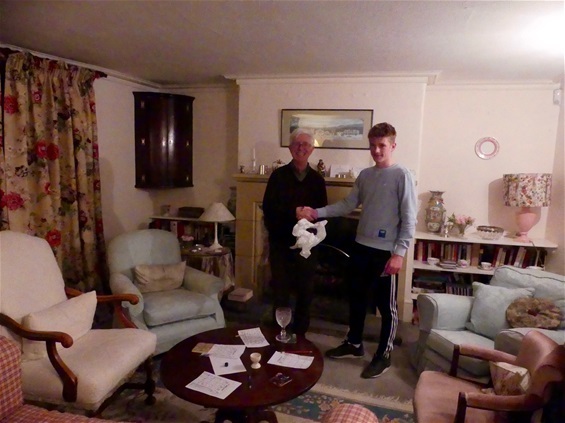 A fun evening with supper for all - and a prize at the end. SATURDAY 25th NOVEMBER - Christmas Fair at Hawton Church. Crafts, cakes, carols, mulled wine and mince pies. A truly magical event for all the family. TUESDAY 5th DECEMBER - Carols by candlelight at Hawton Church, 7pm. TUESDAY 12th DECEMBER - The flowers of the South Atlantic. 7pm, at Hawton Church. An illustrated talk by Peter Tyrer with the help of John Croxall, FRS. Refreshments provided. September 2017. The churchyard garden is currently being developed with wider flower borders. Wiil all those interested in donating flowers or helping in any way please contact Helen Tyrer. January 2018. We are compiling a history of Hawton and Cotham from 900AD onwards and would like any material relevant to this enterprise. Please get in touch with us or any member of the PCC if you have any information. We are also hoping to publish a new version of the late John Quarrell's excellent book about Hawton Church published in 1994, as there are new theories about the nature of many of the stone-carvings. We are now going ahead with the ordering of new pew runners following a successful grant application (AllChurches Trust) and generous donations from members of the congregation. March 10th, 2018. On this Saturday, at 6.30pm, we are celebrating Mothering Sunday at Hawton Church. This is an opportunity to join in singing all your favourite hymns. Good Friday, March 31st, 2018. Passover meal. Hawton members to cook lamb and other ingredients as previously arranged. Tuesday, April 17th, 2018. 7pm at Hawton Church, Tickets £5 (to include refreshments) from RST Music Shop in Carter Gate, Newark or from Peter Tyrer (01636679245). This will include a video presentation and discussion between Peter Tyrer and the Reverend Richard Coles about the significance and implications of 'near death experiences', a controversial subject involving science and spirituality. 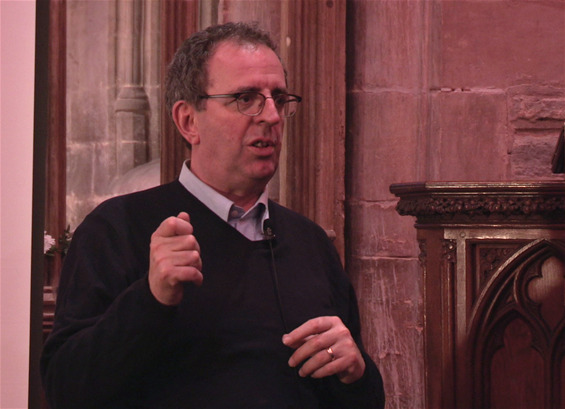 Richard Coles is highly unusual as although he is a well-known radio and TV presenter (and former pop star) he is also a vicar at a parish church in his home county of Northamptonshire. He is always insightful, amusing and informative, so this is an occasion not to be missed. Tickets also available from David Britton. May, 2018. Open Gardens and Cotham Outing, Saturday, May 26th. 10.30-18.00. Donations in lieu of tickets. The gardens at the Rectory (Ann Sowerby) and The Poplars (Helen Tyrer), both in Hawton, will be open to visitors and the bonus of sheep and lambs of a distinctive and unusual breed (zwartbles) as well as chickens, will add noise and colour. This will be linked to a tour of Cotham Church 3 miles away, an essential visit for those who have not been before. May to July, 2018. As part of the Heritage Lottery grant a bell garden is being created in the churchyard. This will be in the shape of a bell and will be populated by bell flowers only. All those interested in donating bell flowers please get in touch with Helen Tyrer. We also have a link with Christ Church Cathedral in Stanley in the Falkland Islands and are planning on bellflowers from the islands to be included. The bell garden will be inaugurated on 8th July before the last performance of the Newarke Canterbury Tales by George Dawson. Thursday June 14th, 2018. 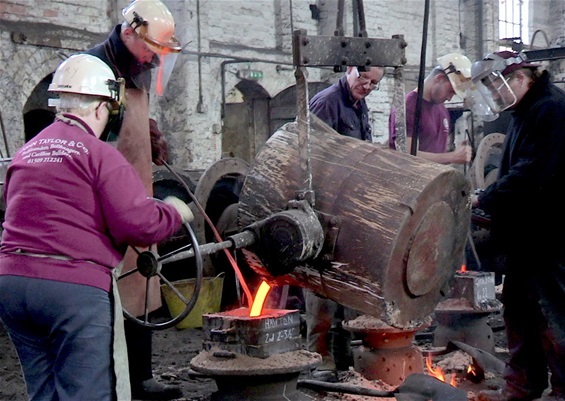 The second new bell was cast at John Taylor's Bell Foundry on 14th June. We had a full complement of visitors, including a party from Chuter Ede Primary School, to visit the foundry and see the new bell being cast. Some photos of the event are shown at the top of the events page (we want as many people as possible to know about this). Saturday, 7th July, 2018. Open churches in conjunction with Diocese of Southwell. Thursday 5th, Friday 6th, Saturday 7th and Sunday, 8th July 2018. We are performing a modified version of the Canterbury Tales - the Newarke Canterbury Tales, as part of the programme approved by the Heritage Lottery Fund. This is an original drama to support greater awareness of the Heritage of Hawton and the Restoration project and is planned to be performed in Collingham (5th July)(Youth Community Centre), at Newark Parish Church (6th July), in Southwell Minster (State Chamber) on 7th July and at Hawton Church on 8th July. Additional grant support will also help the Tower and Bell Restoration Fund. There will be a cast of around 30 but it will vary at different locations. In conjunction with the last performance in Hawton there will be a mediaeval fair (entrance £5, children free) in the afternoon of the 8th July, and we will need many to join in the events. This includes a host of mediaeval games, including quoits, skittles, juggling from an expert (with lessons for juniors), a beer and mead tent, hide-and-seek, and a tug of war between two burly teams. You can also test your ability to throw sponges accurately at miscreants in the stocks. There will also be a hog roast at 2pm (with a 14th century vegetarian alternative) and the formal opening of the churchyard bell garden just before the 7pm performance. There will also be a bookstall where you can buy The Watermeadow Mystery: The Secret Treasure at Hawton, at a speical price just after publication. Tents and marquees are being set up in different places so there will be much to explore. Anyone interested in attending or taking part should get in touch with either of the churchwardens. Tickets for each performance available from the churchwardens and others cost £5 for each performance (available from RST Music, Cartergate, from the two churchwardens, from the Minster Shop in Southwell for the State Chamber performance), and from the Sir John Arderne pub in Market Square for the Newark Prish Chuch event. Rehearsals will often take place on Sunday afternoons after the morning service so if you wish to see what is going on please dally a little. The other Tales include the Wife of Bath making an early case for feminism and a bell-ringers' tale about Greek Gods competing for the hand of Terpsichore, the Muse of Music, in a bell contest. It all sounds strange, but it will be fun. At each of the venues there will be a refreshment interval. For those not able to come the performances there will be a film made as part of the Heritage grant output. Friday 29th September. 7pm. There will be a jazz concert from Decent Chaps, the well known jazz and swing band, at Hawton Church, in aid of the Fabric Fund. Tickets available from RST Music (Cartergate), Ann et Vin (Castle Gate), or via Newark 705505. £10 each. This was an excellent occasion with both a feast of music and a veritable feast of refreshments at the interval. Over £500 was collected for the Fabric Fund. 'Saint Agatha's legacy: the nursing crisis in the NHS'. See below. Hawton Church hosted one of its most inspiring talks in its long history on the evening of 11th October. Dr Peter Carter described how, despite the buffeting and depredations of successive governmental underfunding, the nursing profession was holding up well and still had members firmly devoted to dedicated service and the Christian ideals of compassion and care. The £12.8 billion wasted on the failed NHS record system could have solved the nursing shortage twice over, but instead further job losses were expected as nurses who were EU nationals were returning to their countries and would not be properly replaced. Dr Carter illustrated his talk with film clips from the beginnings of the NHS in 1948 and from nursing care today. An animated discussion over refreshments followed in which threads of optimism were found. The average age of student nurses going into the profession used to be 28. Many experienced older people went into the profession and reinforced its ideals, but this soure of recruitment was reduced when bursaries were removed. They urgently need to be restored, as they have in Scotland. Grass-roots anger is developing fast. Thursday, 18th October. A lecture will be given at 7pm at Hawton Church by Professor Julian Evans entitled 'God's Trees'. Julian is a former chair of the Forestry Commission and knows his subject inside out, and is reputed to be a highly entertaining lecturer. This was more than confirmed by his illustrated, well-crafted and informative talk that included evidence that the description of the trees and their fruits in the Bible were remarkably accurate. The 'Crown of Thorns' also attracted much attention. Saturday, 27th October. The annual Beetle Drive will take place at the Poplars, beginning at 6pm. This is a high tension event and participants must have a strong constitution. The winner of the Drive was Richard Hopkins, followed closely by Colin Dudman, who were both rewarded for their efforts with giant trombocino squashes. The consumption of these particular vegetables will take many weeks and is bound to leave abiding memories. 11th November 2018. To celebrate the 100th anniversary of the signing of the Armistice in the Great War, Hawton Parish Council have arranged to have a bonfire in the car park adjacent to the church grounds. We would like the bonfire to be lit by someone (or more than one) who had a relative who fought in the Great War. Please get in touch with Helen Tyrer (Chair of Parish Council) if you need further information. The bonfire will be lit at 7pm but all are invited to meet at 6.45pm. Invitations are being sent to the population of Hawton and the church congregation but relatives and friends are also invited. 65 people, a total larger than the population of Hawton, attended this memorial event on a fine and relatively windless November evening. Solemn statements of remembrance were made, a poem by Siegfried Sassoon was read by Harry Robinson, and the crowd moved in a circle around the woodpile in the centre of the car park. The bonfire, imaginatively and safely constructed by Tom Pykett and Philip Hardy, blazed merrily after young people sprang about it with flaming tapers, while others warmed themselves as the fire caught hold. Sausages, with and without rolls, baked potatoes and beans, followed by samosas, dips and flans, and finished off with mince pies, Mars bar cake, tea and coffee, completed the evening in the church. So all, we trust, were satisfied with the evening when they left at 9 o'clock. Saturday, 24th November, 2018. Christmas Fair in Hawton Church. Put this in your diaries now. This event gets bigger every year and the quality is outstanding. We did indeed have a magnificent Christmas Fair on 24th. 115 people came to over 20 stalls and £1300 was collected for the Church Fabric Fund. Carol singing by the choir added Christmas icing and there were many extra ingredients to add to the Hawton Extravaganza Cake of multitudinous fancies, and mince pies. Thanks to all who came. Maundy Thursday, 18th April: Passover meals at St Peter's Farndon, at 6,30 pm.